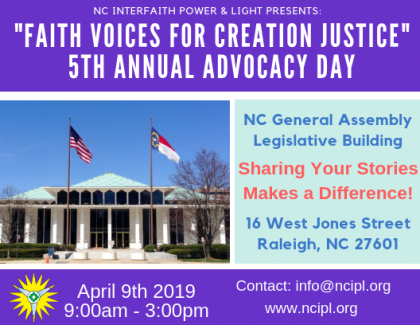 Join NC Interfaith Power & Light and Sierra Club for a joint advocacy day at the North Carolina General Assembly from 9:00 am to 3:00 pm on April 9, 2019. Meet with elected officials to hear their visions for NC’s future and to express your support for clean energy, not fracked gas. Information on current bills, talking points, office location maps, and resource packets will be available for all registered participants.